A growing population, improved transport and a step-change in amenity, career opportunities and lifestyle underpin the demand for new homes in the city. While delivery has grown in recent years, there is a historical shortfall in the number of new homes. 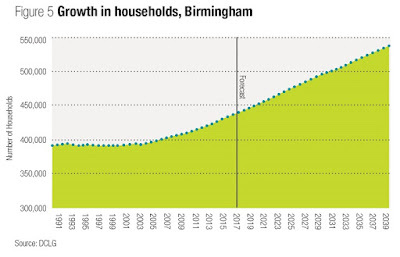 The number of people living in Birmingham will rise by 171,000 to 1.3 million by 2039, according to the latest official population projections. This translates into nearly 100,000 additional households being created over the next two decades or so, as seen in the chart below. The undersupply of housing across key locations in England is well documented, but a more nuanced picture emerges in Birmingham. While there was strong development activity before the financial crisis, as shown in figure 6, development levels were then muted for a prolonged period. In the year or two after the financial crisis, the lack of activity may well have been due to an overhang of supply and more modest economic activity. However, there has been significant economic growth since 2013, and the market is still in ‘catch-up’ mode when it comes meeting potential demand. 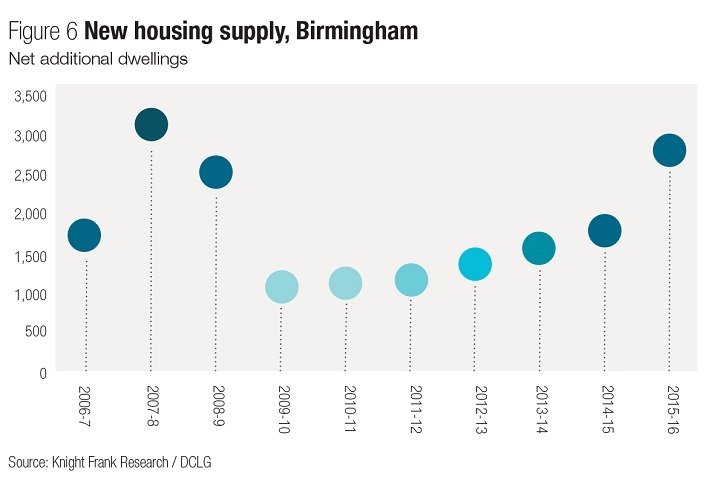 Official data shows that around 8,000 homes were completed in Birmingham between the start of 2011 and the end of 2016, while household projection data suggested that demand was closer to 20,000. However, the number of housing new-build properties helped boost the supply of new homes, the uplift was also due to an increase in the units delivered by ‘change-of-use’, typically where offices were turned into new homes, under ‘Permitted Development Rights’. There is currently a discussion among policymakers around how much housing is needed across the country, including Birmingham. A recent consultation published by DCLG on calculating housing need suggested that rather than an additional 4,461 new homes a year, as indicated by household growth projections, the city needs 3,577 new homes a year. The new calculation takes into account other factors such as affordability. Looking to the future, the most recent planning data suggests that around 13,850 private residential units are in the development pipeline – either under construction or with planning granted. Of these, schemes which will deliver 6,800 private units are currently active on site. However, it is important to note that not all schemes with planning will come to fruition, and some larger schemes may take many years to complete. Focusing on central Birmingham, the development market has been very active in this area in the last few years, with just over 4,000 units under construction, as shown on the map. However, It is worth noting that some 1,500 units under construction are Build-to-Rent and are therefore not available for open market sale, although they will still meet housing need under rental tenure. In addition, off-plan sales for schemes currently under construction have also been high, so the number currently available to buyers is significantly lower than the total pipeline delivery figures suggest. In a market where development activity is robust, best-in-class schemes will be the best positioned to outperform. 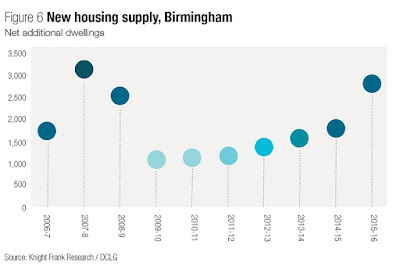 The activity and demand for housing in Birmingham, especially in the city centre, has acted as a driver for land prices. Knight Frank’s urban brownfield land index – which tracks the values of a basket of sites in five cities including Birmingham and outer London has risen by 22% since December 2014, and much of the growth in the last year has been spurred by the Birmingham market. 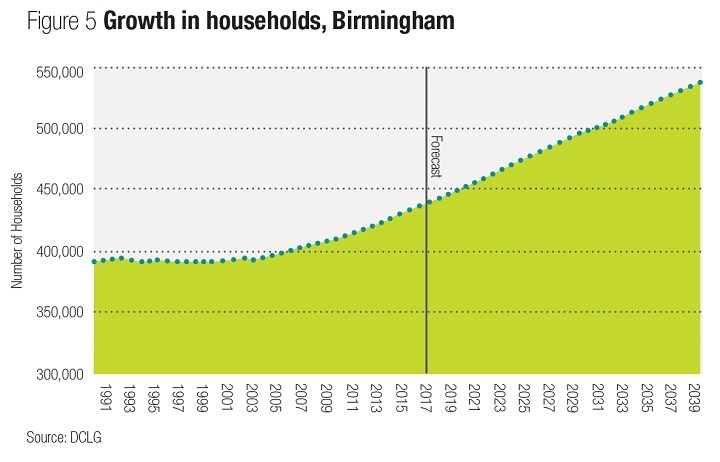 Given the uplift in job creation and amenity in the city centre, examined elsewhere in this report, the demand for city-centre living is expected to continue to grow, and the improvement of transport infrastructure both within the city and between Birmingham and other key UK cities, is likely to further augment this trend.